Yesterday afternoon, I practically cheered when I heard the news that Barbara Bush&apos;s reported death had been “fake news”. Then last night, I heard that the fake news had turned into real news, and was suddenly saddened for her family…but also for those of us who felt strengthened by her love of family, duty and country. Unbeknownst to Mrs. Bush, she was a stable and beloved mentor for me, as I always found her to be wise and helpful in her public comments. I used her as an advisor throughout my adult life. I am the daughter of parents who came of age in the “Hippie Generation”, and while I&apos;ve always thought of them as being rather conservative, when I told my mom I had turned down a full scholarship to law school to stay home with my nine-month-old baby, and that we wanted to have more kids, I could see that my mother was disappointed. She had stayed home with me and my brother, but she didn&apos;t see that as a choice so much as a requirement…and she had always trained me to be a go-getter, a career girl. For me to turn down an amazing offer “just to be a mom” upset her, more than I had expected. I had expected my peers to be shocked and disappointed, but not her, who had been a stay-at-home mom. And I wondered, am I making the right choice? Then I remembered Barbara Bush&apos;s words spoken in 1990, and was comforted. “Fathers and mothers, if you have children, they must come first. You must read to your children and you must hug your children and you must love your children. Your success as a family, our success as a society, depends not on what happens in the White House but on what happens inside your house.” And that&apos;s why I made the decision I did. I knew, deep inside me, that what happens in my own house was inherently more important to my own children and to everyone else&apos;s children, than supposedly important politics. So I happily shelved my ambitions and stayed home, reading to my children every night and enjoying each moment in their little lives. I stayed at home exclusively for twelve years, at which point I felt called to teach. And again, here, I heard Barbara Bush: “. . . learning never ends, and as we enter the next century, it will be more and more important for all Americans to be lifelong learners. . . . every one of us can contribute in some way to a better-educated America.” I was called into the classroom to help contribute towards making other people&apos;s children better educated, even as I educated my own kids at home. And that calling has fulfilled me, as I love what I do. Years later, I felt called into public service. And the wonderful Mrs. Bush again provided me with mentorship advice. She had said, “Some people give time, some money, some their skills and connections, some literally give their life’s blood. But everyone has something to give.” As a teacher with four children at home, I hardly had money to give, and chose not to give my life to military service. But time and skills, those I could donate to issues and organizations of my choice. I chose to involve myself in groups that help kids and those that help my community. So today I&apos;m still involved with a local football organization, my city, and a local nonprofit that helps kids and our greater community. I have something to give, and do. 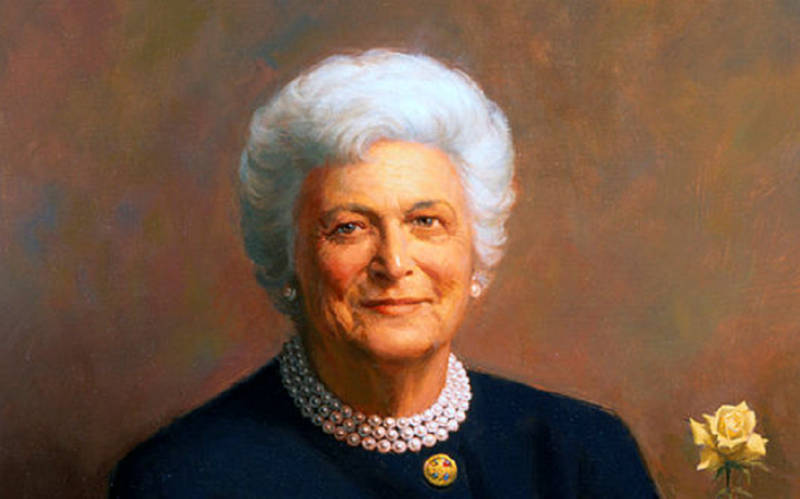 Thank you, Barbara Bush, for all your advice over the years. Thank you for soothing me over hurt feelings, inspiring me to be a better mother and a better teacher, and urging me to give back. I know your family will miss you, and as a Christian I am thrilled for you to be in Heaven, but I will miss your grace, your faith in family, and your enduring willingness to laugh at difficult things. As I told my husband last night, the Bush&apos;s family loss is the world&apos;s loss.